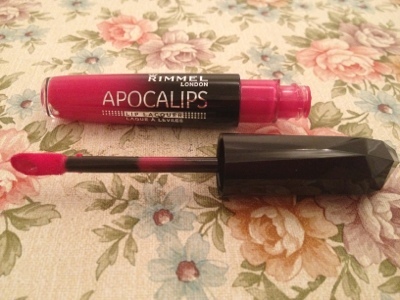 This week saw the launch of the new 'Apocalips' from Rimmel. 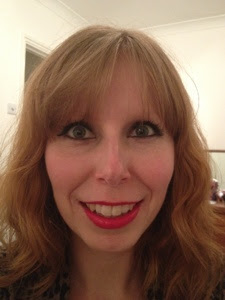 A mix between a lipstick and a lip gloss, these liquid lipsticks have been causing a sensation among beauty bloggers. I have to thank the wonderful Charl for sending me two of these beauties as for reasons unknown, her local Boots put them out early and knowing how desperate I was to try them, she sent me the shades ‘Big Bang’ and ‘Apocaliptic’. Big Bang is a classic red colour. Aside from the glossy finish, it’s what I’d describe as ‘vintage red’. Apocaliptic is what I like to call a ‘power pink’. It’s bright pink, blue based and I think it will look good on most skin tones (even my pasty white). 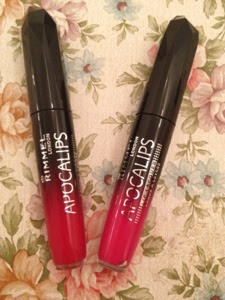 Apocalips come in what looks like a funkily shaped lip gloss tube. The bottom of the tube is clear, so you can get a really good idea of what the shade is, without having to open it up. There is a doe-foot style applicator which make application really easy, although if you have a thin upper lip like me, be careful with the bright shades, as if you go outside of your lip, it really shows! One dip in the tube was enough to do both my lips. I did go for the traditional lipstick application method of ‘apply, blot, reapply’ as for me, I find this gives the best staying power (and also stops any product going on my teeth). I decided to give these a good trial as I was intrigued about their staying power. So, I ate and drank and to be fair, they stayed on pretty well. The glossy finish wore off, but a nice stain was left behind. I also tested them a bit more by wearing them to my exercise class (yes, I was the idiot wearing bright lippie whilst sweating it out). Surprisingly, they stayed put, aside from one small incident where I hit my face with my hand and smudged it (my bad). I love them. They are long-lasting, non-drying and have a great variety of shades (8 in fact). 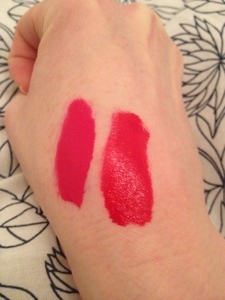 For £5.99, they are a total bargain and remind me of a more creamy version of a YSL glossy stain. You can find them at Boots and Superdrug. Run and get yours fast! These shades are popping! They look lovely, the one your are wearing looks fab, you look great! I wish I was brave but you know I am not. I am road testing mine today. I will wear it to my spin class at lunchtime and see how it holds up! they are fab, and a bargain! Really want to try big band, you look gorgeous! Apocaliptic looks gorgeous on you Kat! I bought celestial today. Can't wait to put it to the test! Hi! I could have sworn I've been to this website before but after reading through some of the post I realized it's new to me. What's on my dressing table?